This cute-as-a-button newly renovated waterfront cottage is located on Southport Island across the swing bridge from Boothbay Harbor. "Periwinkle" sparkles with fresh coastal decor and hardwood floors throughout. The first of two bedrooms offers the option of a king size bed or two extra long twins. The second bedroom has one twin bed. The living room has a full size sleeper sofa. The covered porch and boathouse* deck provide perfect places to relax while watching the bridge open for passing boats and listening to live music from Robinson's Wharf across the cove. Walk there to dine in, or take out lobsters, other Down East offerings, and landlubbers' fare. 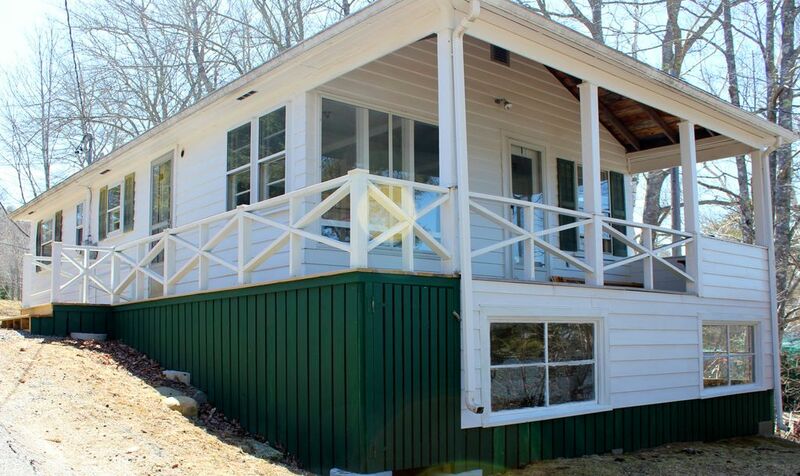 *The boathouse is under renovation but this does not interfere with the use of the deck. Points of interest within approximately 2-4 miles include Dogfish Head Beach and Hendrick's Head Lighthouse, Boothbay Harbor (dining, shopping, boat tours, golf, YMCA), Maine State Aquarium, and Coastal Maine Botanical Gardens. Please note that laundry is 3 miles away. The online description really inflated the property so price was too high for what is provided. No amenities like dishwasher, washing machine, kayaks, BBQ (although the property manager went out and bought a simple charcoal grill many thanks to Tom!). We stayed a week and planned to cook a number of our meals -but no counter space, no where to store purchased food so very challenging to prepare meals.Cheap kitchen utensils.Furniture was rickety and old or or Ikea cheap. Boathouse was a poorly kept up shed. We will not be back. Thank you for your feedback regarding Periwinkle Cottage. We are sorry that the property did not meet your expectations. We go to great lengths to make sure our descriptions and photos are accurate which is why amenities like a dishwasher, washing machine, and kayaks are not listed with this property. Accuracy and transparency are paramount to us, and to that end we will review our description to ensure it accurately describes this listing. Yes it is small and very simple, but that is what guests seem to like about it. The outdoor dining on the deck in front of the boathouse offers spectacular views of the marine traffic and swing bridge opening and closing. We will update our listing to make it clear that the boathouse is under renovation. We thought the photos accurately reflected the size and space of the kitchen, but will consider adding additional language to make sure future guests have clear expectations. There are several shelves in the nook behind the kitchen for additional storage. Thank you for the information about kitchen utensils, we will follow up to make sure the kitchen is properly stocked. We are sorry that the furniture did not meet your standards. All the furniture is brand new this season. The responses from previous guests have been overwhelmingly positive and they have been happy with the accommodations. We hope that you will consider contacting us directly if you come back to this region so that we might offer a property that is more in line with what you are looking for as we do have properties that come with kayaks, a dishwasher, and washer/dryer. In any event, we do feel Periwinkle is priced fairly for a 2 bedroom cottage on the ocean at an autumn rate of $142 per night. We were there for a week hated to leave! It was a pleasure hosting you! Thank you for choosing us and we hope you will visit again! Comfortable cottage on the water in Southport, Maine. Clean and well stocked. Good kitchen facility. Close to many good restaurants. Beautiful area!